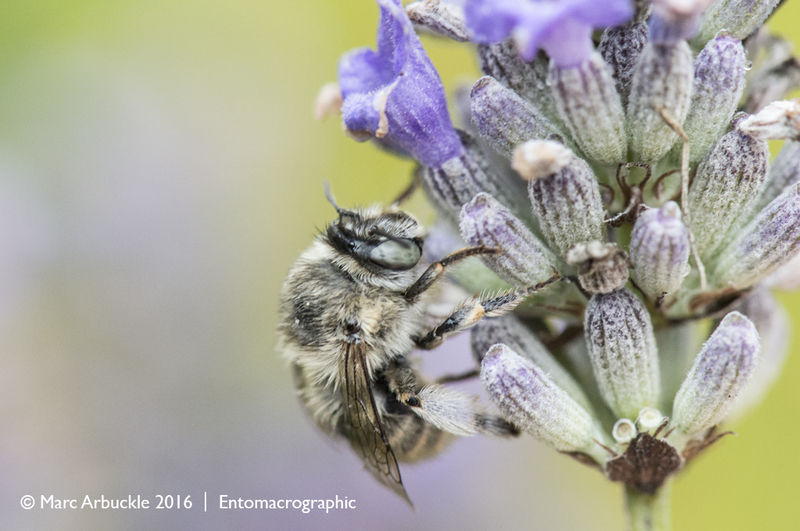 I photographed this Four-banded flower bee Anthophora quadrimaculata during a weekend bee workshop run by Steven Falk, author of the recently published Field Guide to the Bees of Great Britain and Ireland. I think it shows the diagnostic bluey-grey eyes rather well. The course was just one of many hosted by Sallyann Spence at Berrycroft Hub on a working farm just north of Swindon at Ashbury on the Wiltshire/Oxfordshire border. I must say I thoroughly enjoyed it, excellent company, good weather and we even got driven up onto the downs in a 1977 Daimler Pinzgauer high-mobility all-terrain 6WD ex-Swiss army military utility vehicle… what’s not to like? There are over 450 described species of Anthophora worldwide but we only have five species in the UK, all of which can be found in the south of England. Most of you will have seen the all- black female Anthophora plumipes in your garden, fewer will have noticed the buff-haired male which appears a little earlier. It is a lovely bee. Thanks for the Bee shot-beautiful creatures everywhere. I also have a question-Could you recommend a field guide to common british spiders? I have a very dense book with wonderful illustrations that is far too comprehensive for me to use,particularly as I don’t collect specimens other than with a camera. Hello Jim, I’m afraid I don’t know much about spiders but I understand Collins will be publishing a Field Guide to the Spiders of Britain and Norther Europe in December for around £30. Other than that there is a Field Studies Council wall chart which gives a guide to some of the commoner house and garden spiders for £3.50.